Our company has allocated budget in IEE for the Social responsibility. It has signed the MOU with the following institutions for the intuitional support of these local institutions. 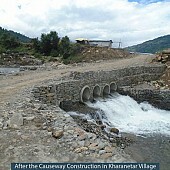 After successful completion of Financial Closure for two Projects: Upallo Khimti Hydropower Project - 12 MW and Upper Khimti-II Hydropower Project - 7MW, our Company is now actively involved in Road construction Programme that will connect the Power house at Jifasa and other important places of Project to the headquarter of Ramechhap district-(Manthali). This road will be constructed from Shivalaya village to 200m below the confluence of Khimti and Ghwang Khola. Connecting many Villages together, this Programme is considered to be a milestone in uplifting the economic condition of farmers in that locality.